Visiting Belmont UMC in Dayton, OH on August 16 to share a little bit about my journey. 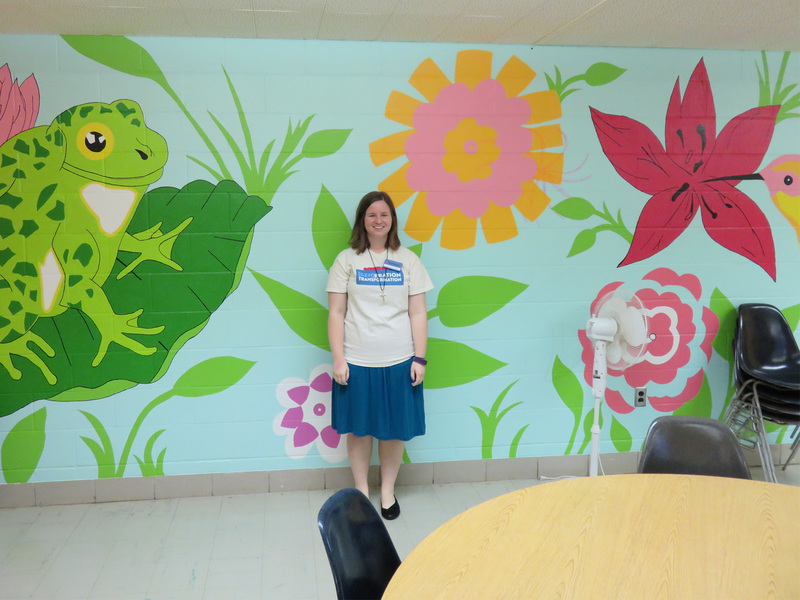 I painted the wall behind me for the English as a Second Language classroom when I was an intern there in January 2014. Today I’m writing from a rainy Westerville, Ohio! Since then, I have been visiting churches in Ohio, talking with my family and friends about training and my future hopes as a Missionary, traveling to Milwaukee, Wisconsin to visit family, painting some, baking some, attempting to play “Für Elise,” and watching lots of re-runs of Gilmore Girls. Go Set a Watchman is at the top of my reading list. In 9 days, on August 26, I will move to Miami, Florida, where I will begin my work with undocumented immigrants and South Florida Justice for Our Neighbors. The day after I arrive, I will travel to the Life Enrichment Center in Leesburg/Fruitland Park, Florida for orientation with the Florida Annual Conference from August 27-30. Then I will have a few days to acclimate to Miami before beginning work on September 3. If you would like to receive additional updates, like my GMF US-2 Facebook page. You can also DONATE to support the work of young adult missionaries. Please remember the Global Mission Fellows in your prayers, especially the GMF International class and Global Ministries staff as they continue their training in Zimbabwe, and the GMF US-2s who will be moving to their placement sites in the next few weeks. I really appreciate all of your continued support.